Thousands of voter registration forms are available on-hand, waiting to be filled out at Student Life and Leadership offices at Taylorsville Redwood, South City, and Jordan Campuses. Voter registration forms take two to three minutes to fill out, and can be found at Student Life and Leadership offices of Taylorsville Redwood, South City, and Jordan Campuses. At the Taylorsville Redwood Campus, there is also a registration booth set up on the west side of the Student Center, directly outside the Student Life and Leadership offices next to The Lair. • Register over the internet at vote.utah.gov no later than Oct. 22. • Visit the county clerk’s office for in-person registration no later than Oct. 22. • Personally mail a registration, post-marked no later than Oct. 9. Student Life and Leadership (SLL) is currently conducting an initiative to get as many Salt Lake Community College students registered to vote as possible. Students can stop into the SLL offices and fill out a simple half-page form anytime between now and Oct. 16 to get registered. “The greatest contribution a student can make to our democracy, both at the federal and state level is by making their voices heard [by registering to vote and voting],” says SLL government affairs chair Elird Haxhiu. Haxhiu has been leading the SLL voter-registration initiative. SLL’s goal is to get 2,000 or more students registered to vote through the voter-registration initiative. According to Haxhiu, SLL is collecting approximately 100 voter-registration forms coming in per day. With 20 days remaining before the deadline, they are well on their way to meeting and even exceeding their 2,000 student goal. The importance of students registering to vote is about students having their voices heard regardless of what political party or platform they support, says Haxhiu. Student Life and Leadership has used a portion of their funding to hire a voter-registration team of 17 individuals to spend 10 hours per week walking around campus, attending student events and bringing voter registration forms directly into classrooms. These members can be easily spotted because they wear shirts that feature the “We Want You” pointing Uncle Sam. 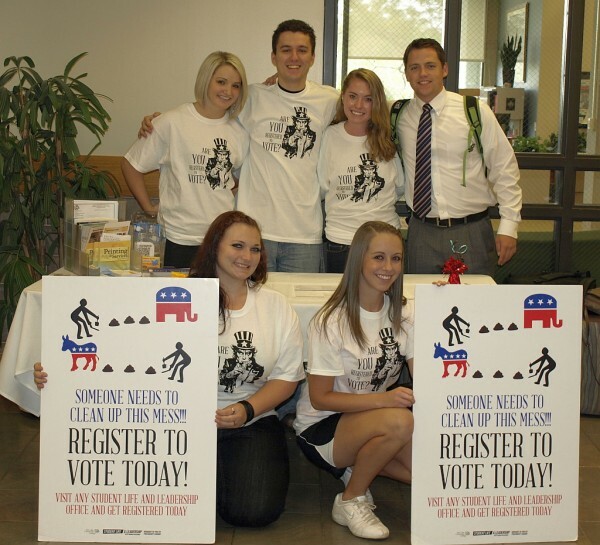 Utah Valley University is last year’s winner of the annual voter-registration contest sponsored by the Lt. Governor of Utah. In order for SLCC to win the contest this year, SLCC must collect the highest number of paper voter-registration forms among all the higher-education institutions in Utah. For those students who are registered to vote there is another contest, sponsored by Education First. This contest measures the number of signatures on a petition to lower the cost of tuition and textbooks, which is also available to sign at the SLL offices. The student body with the most signatures on the petition will win a luncheon hosted by Governor Gary Herbert.